The map above is elegant in its simplicity. 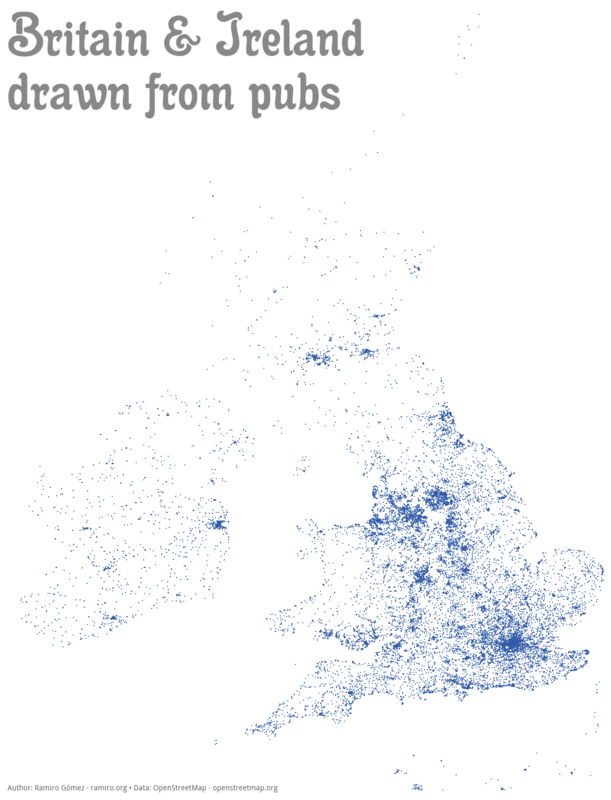 It shows Great Britain and Ireland drawn from pubs. Each blue dot represents a single pub using data extracted from OpenStreetMap with the Matplotlib Basemap Toolkit. Interestingly, if the same map had been drawn using the number of pubs from 1980 it would have looked quite different. In total, the map has 29,195 pub locations across both the UK and Ireland. However, the UK alone has lost 21,000 pubs since 1980 according to the Institute of Economic Affairs, with half of these occurring since 2006. Therefore, a map from 1980 might have had nearly twice as many dots as the one above and possibly not all in the same places. Going back even further, there were a reported 99,000 pubs in the UK in 1905. However, as bleak as the situation may seem, the map above is a good reminder that there are plenty of great boozers left in the two countries.